Anesthesia today is safer and more effective than ever before. New technologies, extensive specialty training, and high professional standards have made the administration of anesthesia one of the safest aspects of a surgical or obstetrical procedure. At UBMC, anesthesia is administered by a certified registered nurse anesthetist (CRNA). CRNAs are advanced practice nurses with specialized graduate level education in anesthesia, and the nurse anesthetist stays with the patient during the entire procedure. During the procedure, the anesthetist constantly monitors every important function of the body and individually modifies the patient’s anesthetic to ensure maximum safety and comfort. Nurse anesthetists have administered anesthesia for more than 100 years in all types of surgical cases, used all anesthetic techniques, and practiced in every setting in which anesthesia is administered. Three basic types of anesthesia exist: general anesthesia which produces a loss of sensation throughout the entire body, regional anesthesia which produces a loss of sensation to a specific region of the body, and local anesthesia which produces a loss of sensation to a small specific area of the body. The anesthesia chosen for a patient is based on factors such as physical condition, the nature of the surgery, and allergies to medications. 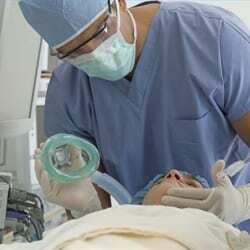 The preoperative interview with the anesthesia provider is crucial in the selection of the best anesthetic. In particular, the patient must be honest, because communication and cooperation between the patient and the anesthesia provider are essential to the patient’s safety. Patients must follow instructions closely regarding the intake of medications, food, or beverages before the surgery.